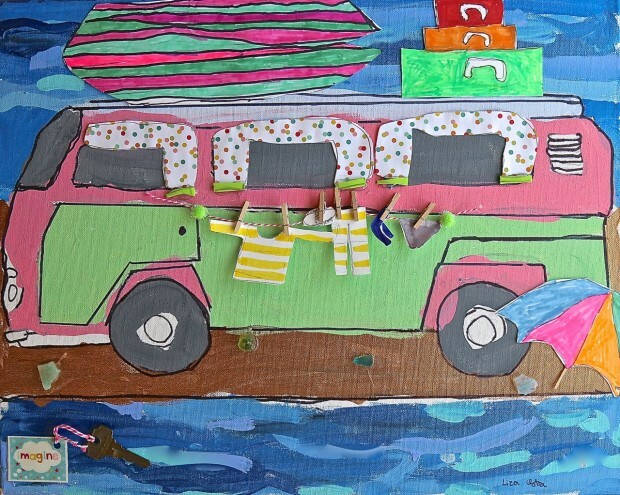 Super excited to share with you our Camper Vans On Canvas created in our workshop with 6-9 year old artists! 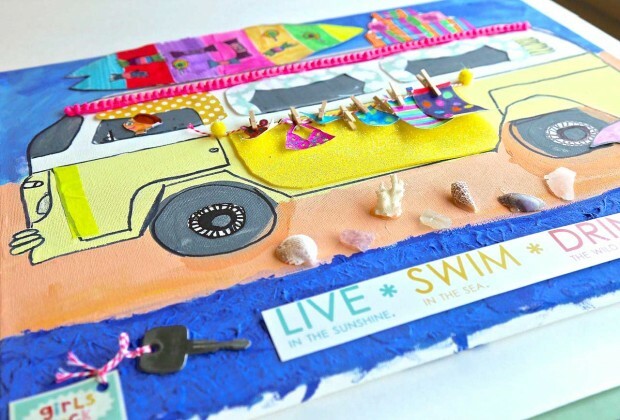 Wanderlust inspired + beautiful mixed media artwork + image used with permission via Mae Chevrette. 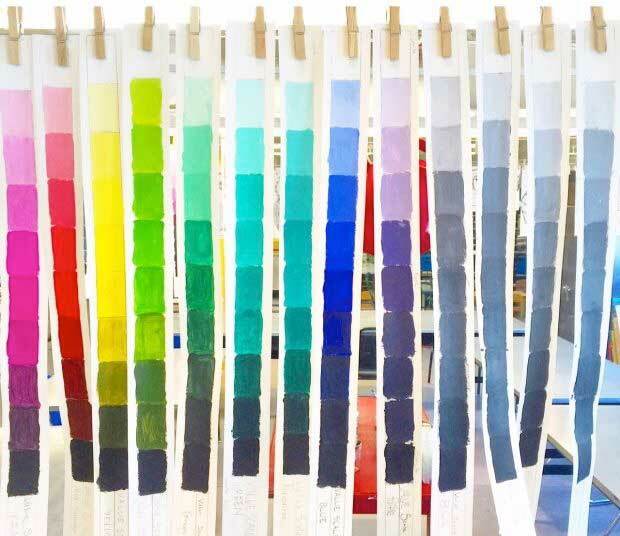 Custom tints individually mixed-up by each artist to coat their custom vintage camper van! A peek at the mouth watering assortment! Didn’t they do a beautiful job creating a wide array of assorted colors? These value scales were created in another workshop of ours with older children, but I had to include them! Color is such an exciting direction of exploration! 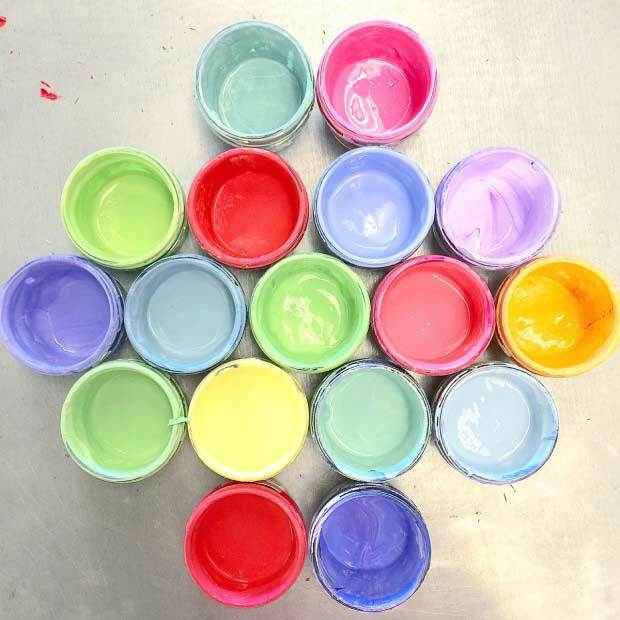 Here we learned how to create tins and shades based on one hue. Maybe you saw these on our Instagram feed? Let the drawing begin! As much as all the vans look similar, they’re not. 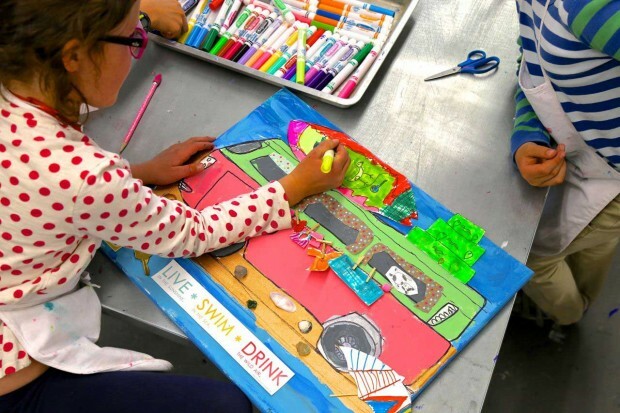 Each van was sketched by hand using a simple stock image to draw from. To get the large “fill the canvas” proportion, we used paper strips as our “rulers” to guide the height/levels and overall width. 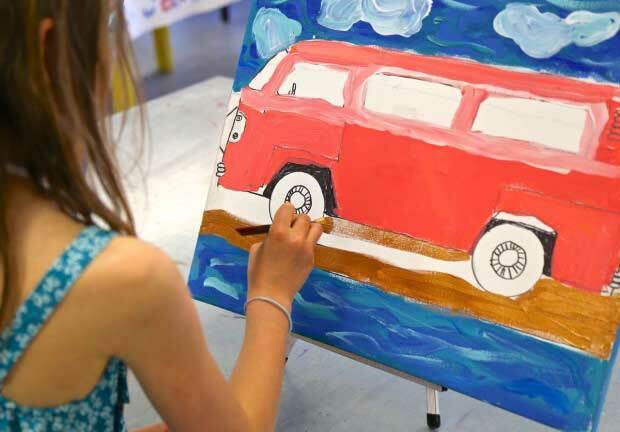 This gives a child placement when starting so they don’t feel so overwhelmed when staring on a big white canvas. We did have a guide for wheel and window placement, and wheels were created with circular metal stencils they traced largest to smallest. Working from a simplified image is always very helpful, so the artist can visualize the important elements and overall shape. Each child used a ruler for the horizontal and vertical lines. We like to empower each child, but it’s important to give them the right tools and steps so they don’t get frustrated with the challenge. Each artist was beyond proud and felt very accomplished drafting this technical drawing! 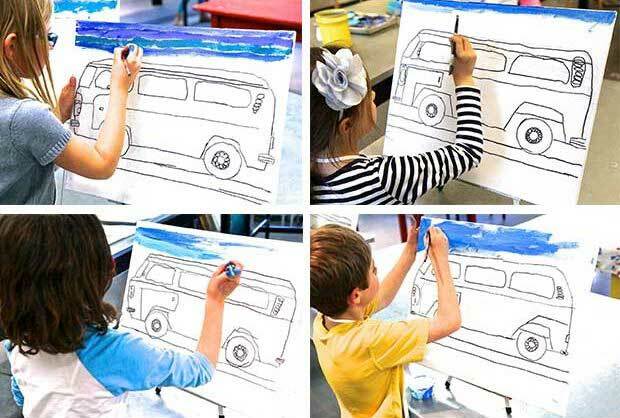 Once each drawing was complete, each child darkened their lines and moved into painting their sky, ocean, beach and vintage camper van. 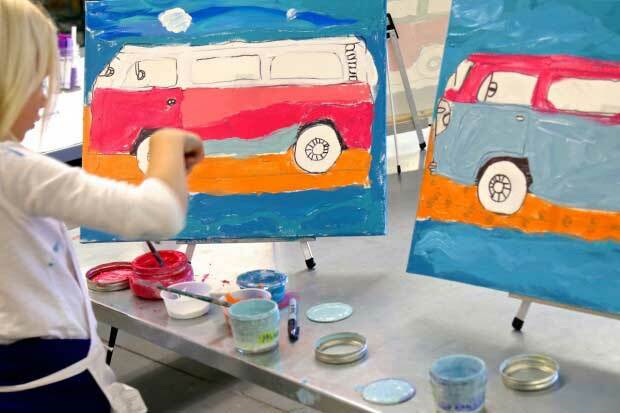 It was beyond exciting to see the camper vans come to life with the hand mixed tints each artist created. 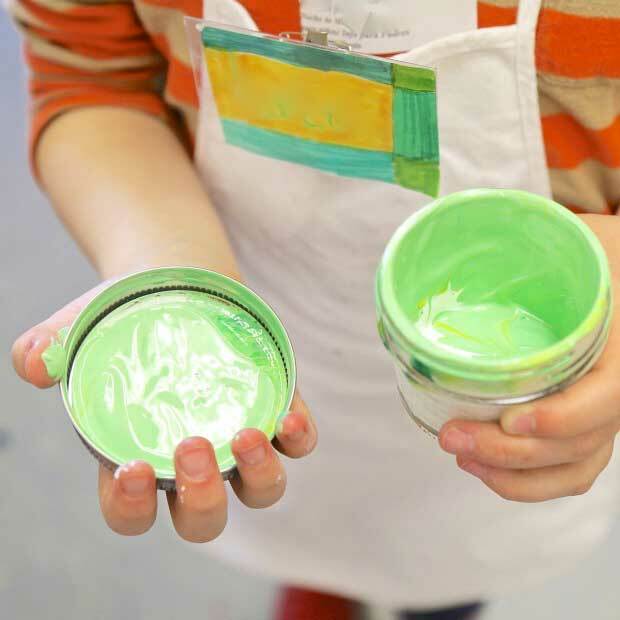 Children love to standup while painting to give them freedom to move about and to be able to step back to see their painting evolve. 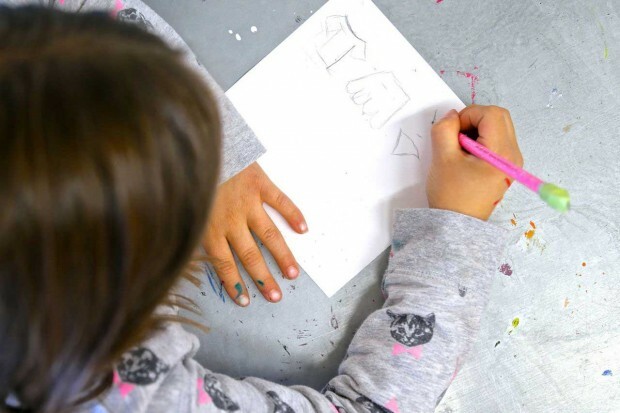 Table easels are a fabulous addition for a young artist! 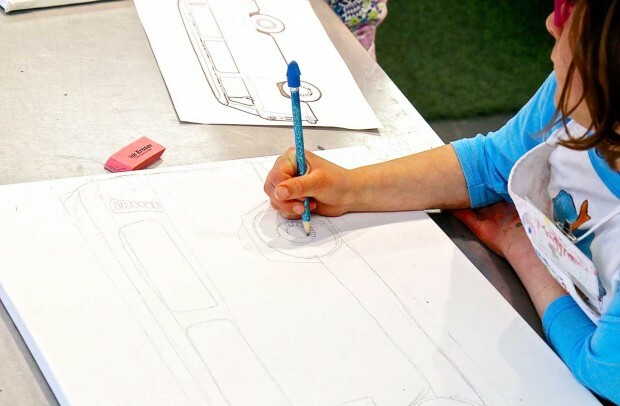 Drawing and designing details. 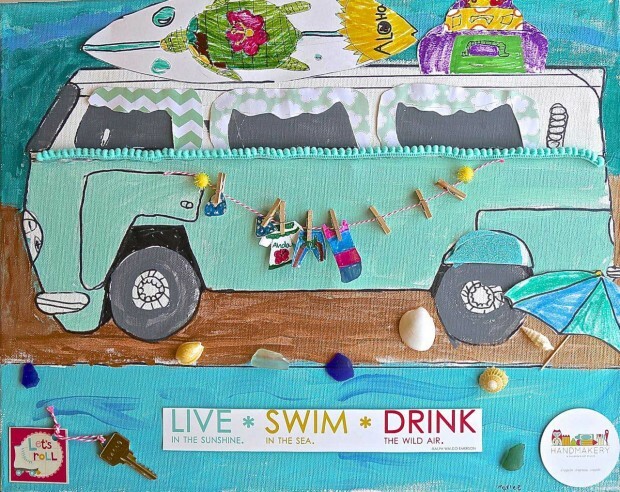 Each artist sketched out a surfboard, set of stacked luggage, an umbrella, curtains for the windows, sand toys and beachwear! We provided heavy weight white paper, cut into general rectangles so each child would have a better idea of sizing. We also led mini demos on how to get started on sketching out these items. It was so much fun to see how they evolved and became so personalized! A mini clothes line and wooden clothes pins were then used to hang the beachwear! 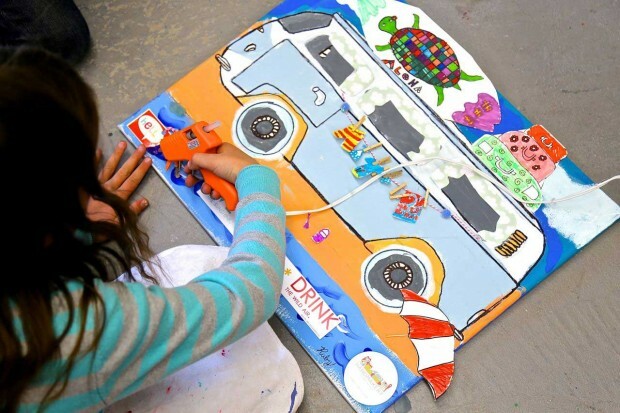 How we love cool temp glue guns to empower children to do much of their own gluing. 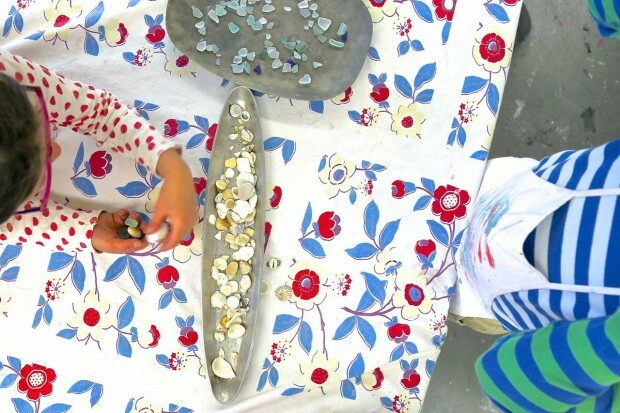 Each artist loved searching and handpicking seashells and sea glass for tiny detail on their beach. A little artist adding a few last minute additions onto her canvas. 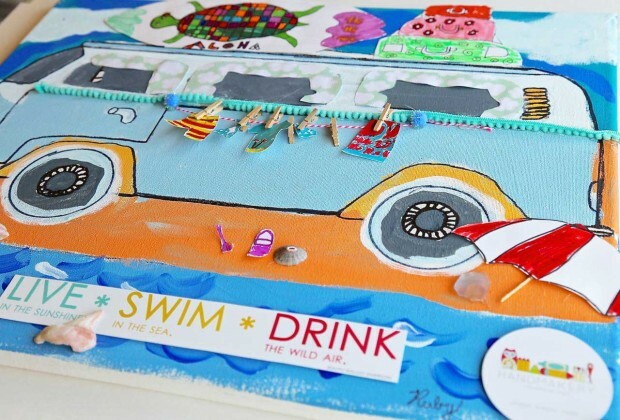 We had a collection of rick rack and foam to incorporate, just love how this artist used both! A little in love with this color for a vintage camper van, think I would buy a camper van in just that exact tint. The metal key was a fun up-cycled treasure to upstart each van. 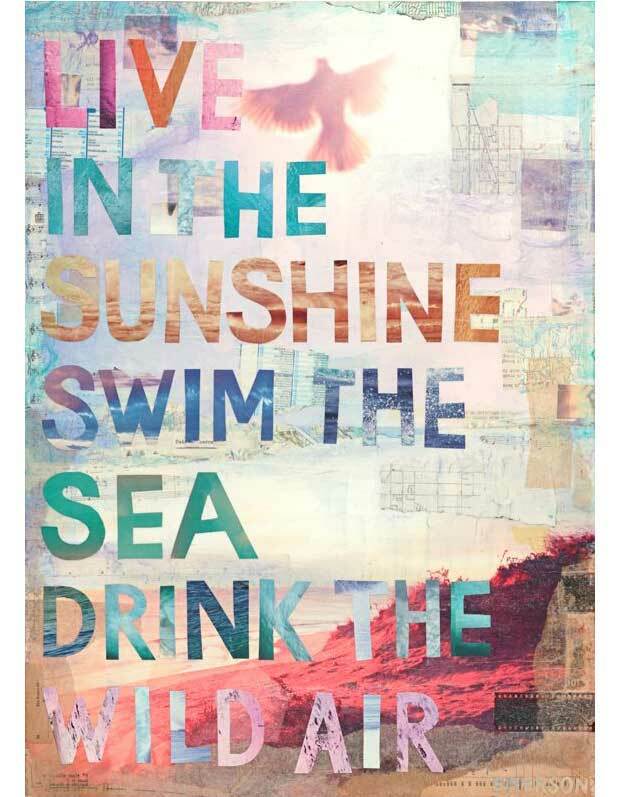 The saying was a well known Ralph Waldo Emerson quote that inspired this whole adventure theme and we had one printed for each artist to be daily reminded of these words to live by! It’s always precious when family and friends join us for our traditional recognition ceremony and mini art exhibit after each workshop! 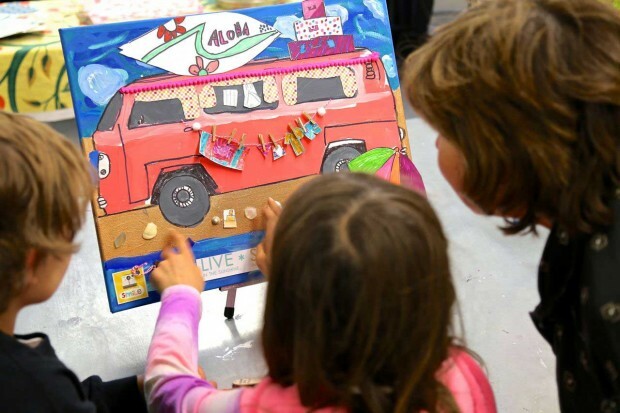 The children are always beyond excited to share what they’ve been creating and absolutely love having their loved ones part of the special night. 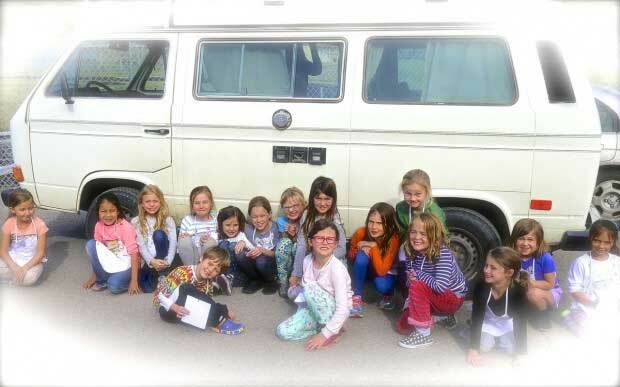 It was beyond exciting to have a real camper van join us, so we could get a “real-world experience” of just how cool these camper vans really are! It was quite the adventure to explore inside and outside of these uniquely designed “home on wheels” … I think everyone wanted one of there very own! 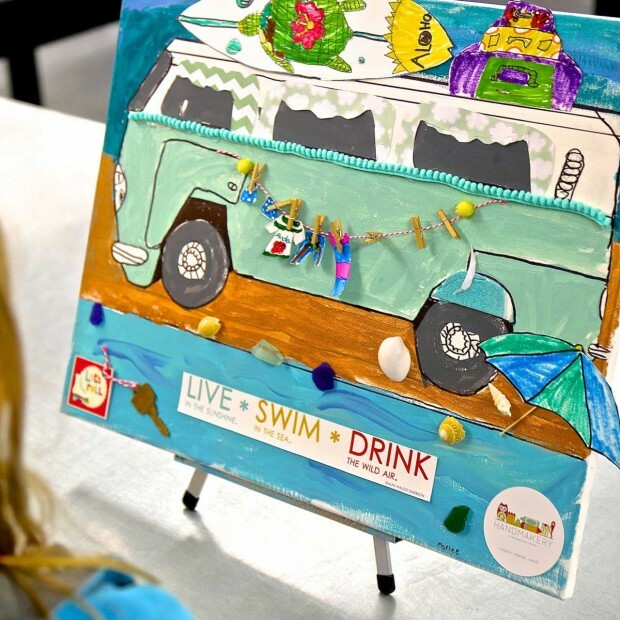 It was beyond exciting to have our Camper Vans On Canvas on display at the Carbondale Branch Library all together for May and June! Take a peek at the collection below! Oh my goodness! These are the CUTEST collages ever. I love what you do. Can I ben your student? How many lessons/hours did this project take? Hello Terri! 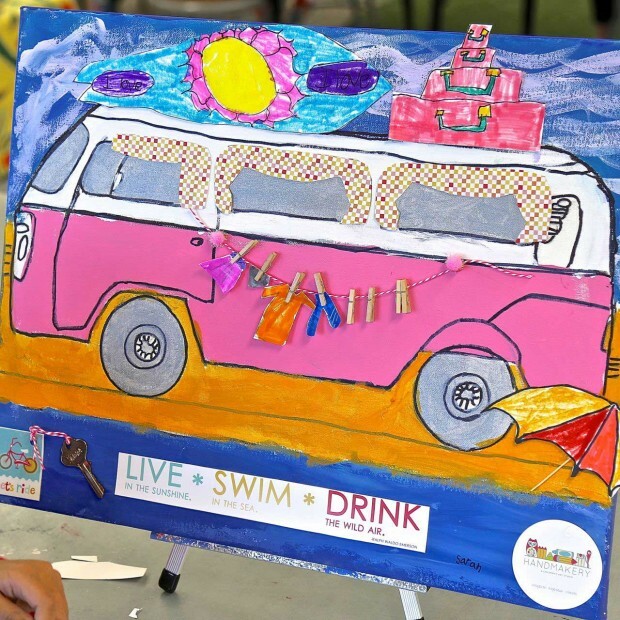 We spent about 6 classes at approximately 1.5 hrs on our Camper Vans On Canvas with all the steps + info! Thank you so much for taking a peek at this project!